In the morning of April 15, at Hue University, Assoc. 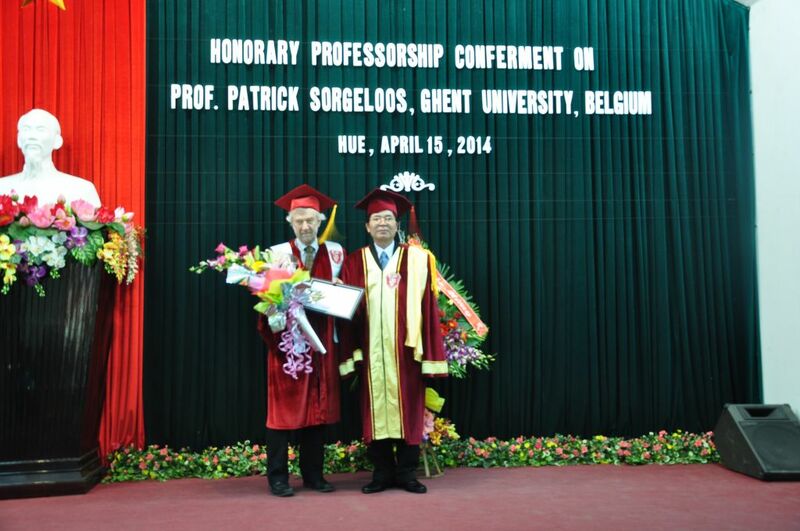 Prof. Nguyen Van Toan, Hue University President conferred the title Hue University’s Honorary Professor on Patrick Sorgeloos, Ghent University, Belgium. Ceremony participants also included leaders of Hue University’s Colleges, functional departments, Hue University’ staff and students received the supervision of by Prof. Patrick Sorgeloosat Ghent University. Prof. Patrick Sorgeloos was former Head of Department of Animal Production, Faculty of BioScience Engineering, Ghent University, Chairman of UGent Committee for Development Cooperation (since 2008), Chairman Flemish InterUniversity Council for Development Cooperation (2008-2012) and other important positions in scientific activities. Prof. Patrick Sorgeloos have supported a lot of our PhD and Master students also. With his important role in aquaculture platform, he has continuously contribute your effort in developing ViFINet, Hue University Research Institute for Aquaculture and supporting Vietnamese scientists in the fields to participate in international conferences. Prof. Patrick Sorgeloosis one of the key persons who have successfully developed the VLIR-IUC Program with Hue University. Under his support, VBFoodNet was built with the participant of Hue University and Hue Research Center for Aquaculture has being developed. Photo of Hue University’s leadership and Prof. Patrick Sorgeloos, together with his close family on the Conferment Ceremony. 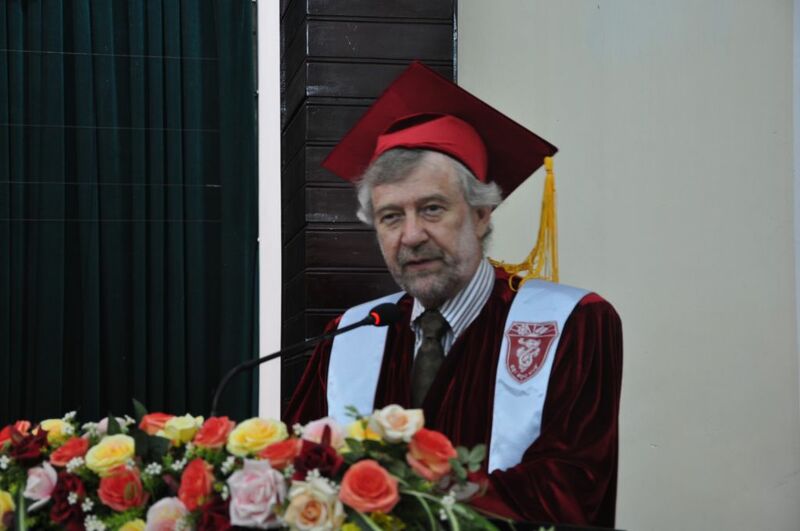 At the ceremony, Prof. Patrick Sorgeloos stated that Vietnam has become so close to him as his second homeland after the longtime of working in throughout Vietnam. 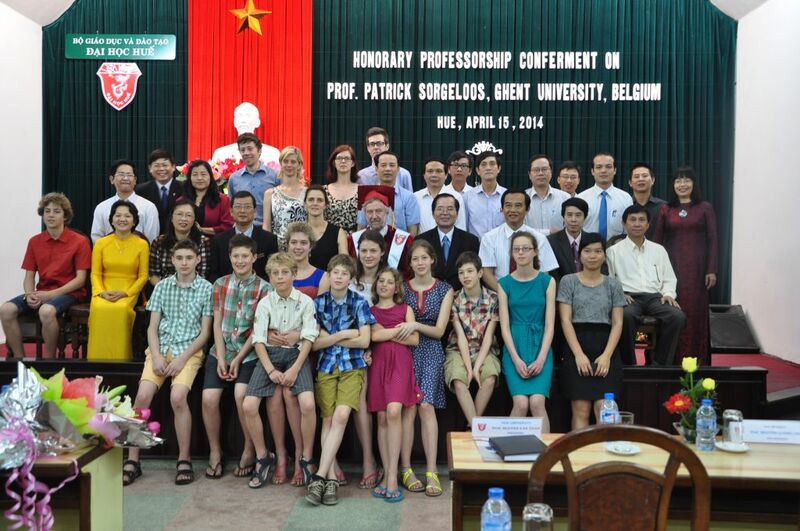 Professor high valuates young people in Vietnam who will contribute to the new cooperations. Three main tasks of a university, according to Prof. Patrick Sorgeloos, are the excellences in education, research and society contribution. Assoc.Prof. Nguyen Van Toan, Hue University, treasured all of great contribution of Prof. Patrick Sorgeloosto Hue University. After leading the rector delegation of Belgium universities to Hue University on April 4, Prof. Patrick Sorgeloos has set a firm foundation for cooperation between Hue University and VLIR – UOS, particularly, developing a twelve year VLIR-IUC Program with Hue University.